Summer treat for adults! 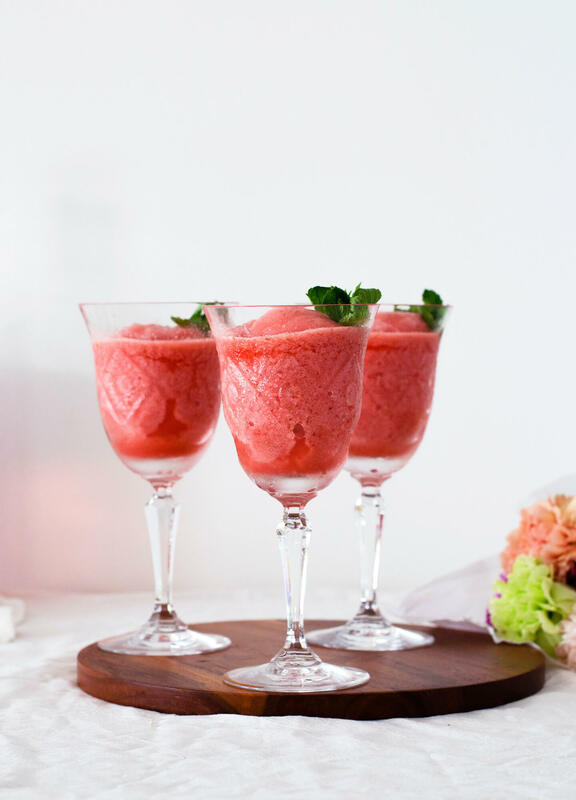 A lemon strawberry frosé that is super simple to make. August is serving us some real hot summer days! We’re in the middle of a long heatwave right now, all our drinks are packed with ice, the air conditioning is ON most of the time and we’ve been enjoying tomato salads for dinner. With either sandwiches or eggs in some form, all very breakfast for dinner type of meals. (Don’t you just love breakfast for dinner?!) I’ll make our weekly pizza in the oven but that’s about it. So being in this whole summer mess, it only makes sense that booze is ice-cold or frozen too, so I made us this lemon strawberry frosé. I have to say I am beyond ready for Fall. Now I know it’s still summer and I know some of you love it, but I’m more of a chilly-weather type of girl. I like layers of clothes and cool air, sunset-dyed trees and that smell the autumn rain leaves behind. But let’s forget about Fall for a second and talk about this amazing lemon strawberry frosé instead. 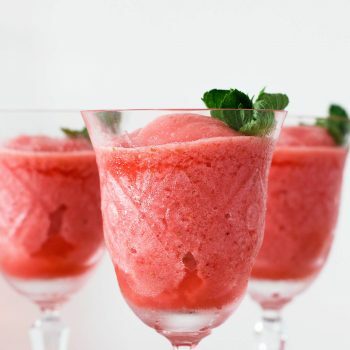 I was flipping through one of Donna Hay’s magazines and there was a recipe in there for watermelon frosé. The idea of that seems divine, but I decided to make my own version with strawberries instead. 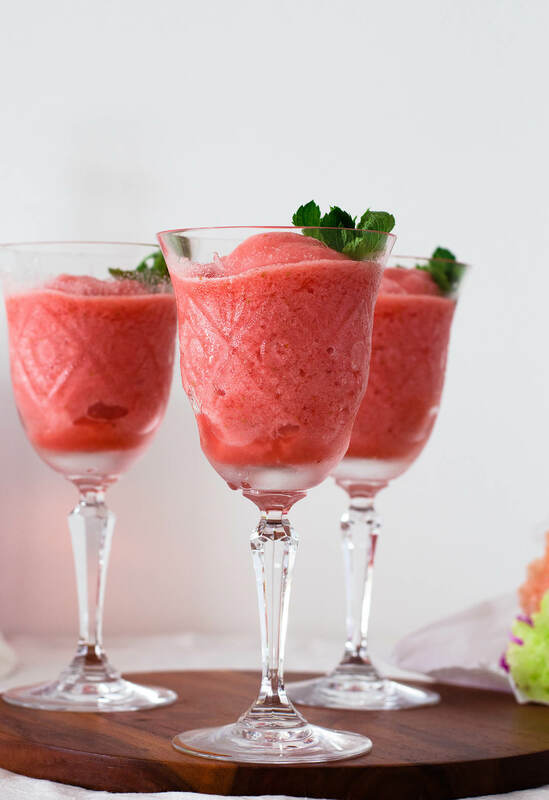 Honestly, I’m not picky when it comes to frosé. I’ll take the watermelon and strawberry frosé and straight up clean rosé if I can. And strawberries and rosé make such an obvious pair, don’t you think? 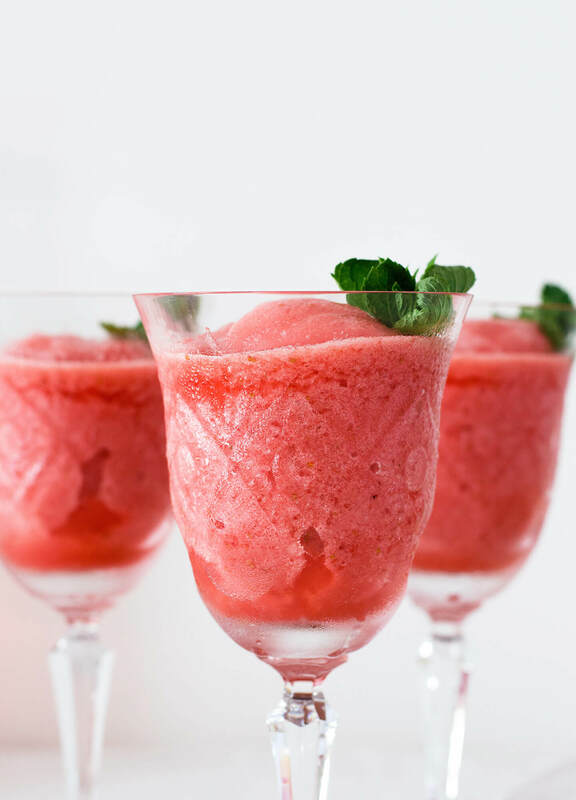 Add some lemon sorbet to that and you really have summer in a glass. 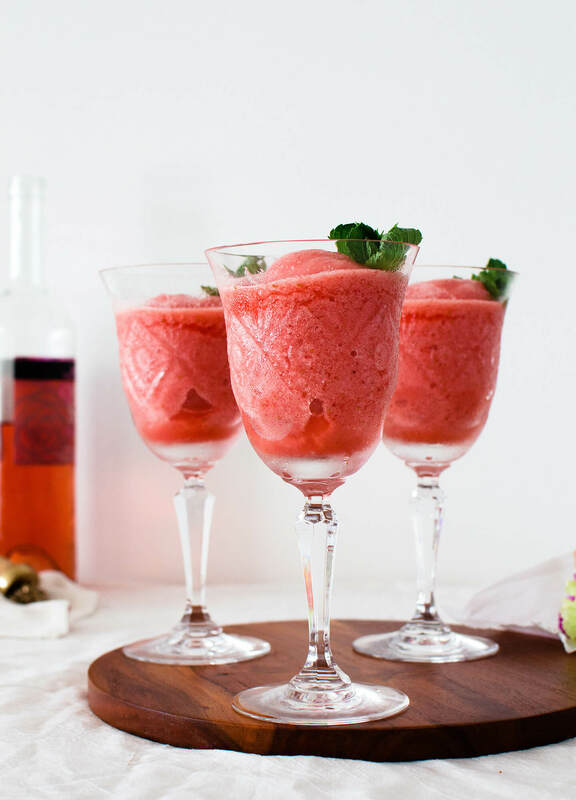 Super simple summer drink or dessert for adults. 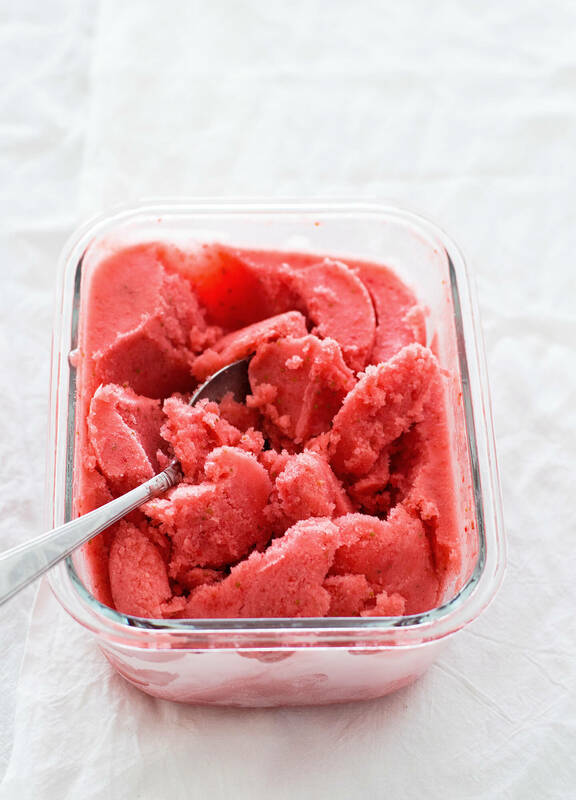 Place strawberries, sorbet, sugar and 240ml (1 cup) of wine in a blender or food processor. Blend on high speed until mixture is smooth. Transfer mixture to a freezer-proof container (I use a glass container) and freeze until solid (at least 3-4 hours or overnight). 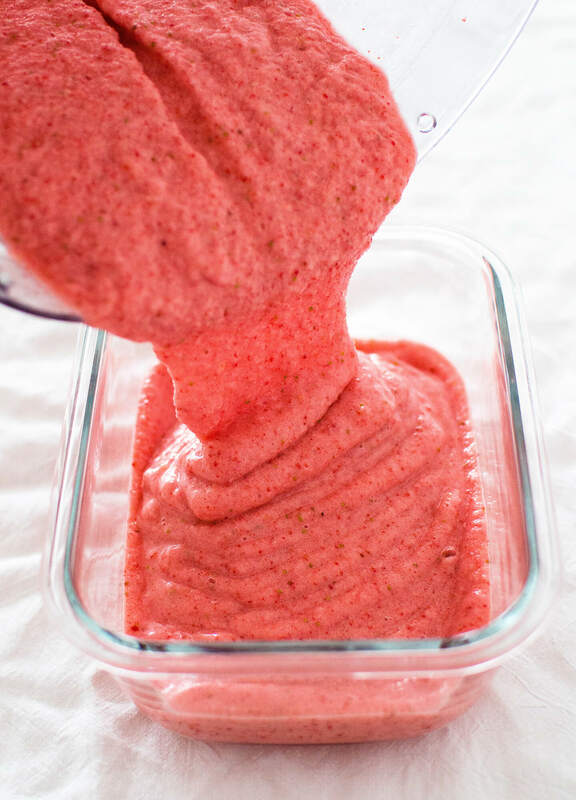 Remove mixture from the freezer and transfer it to a blender (or food processor). Add remaining wine and ice cubes, blend on high speed until somewhat smooth (it’ll have an icy, thick texture, but you don’t want any big ice chunks). Serve right away or put back into the freezer until serving time.